The "Auto-On" feature of the DS500 switches on the scale when the patient taps on the heavy duty glass platform. The weight is shown in a 2” high LCD display. 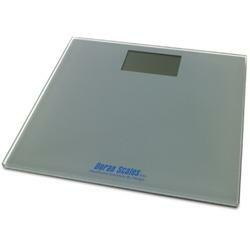 The tempered glass weighing surface is 12” x 12” and the height of the scale is just 3/4” high. The DS500 can display weight in lbs or kg. The accurate results of the DS500 are easy to read, thanks to the easy to read display and 2" tall numbers.